Bank loan may be following two categories on the basis of nature. 1. Credit from Banks Fund. Loan is the sum being made available by transfer from loan account to the customers current account. It is made to a customer which a cheque account at a bank, in which the account is allowed to go into debit, usually up to a specified limit. The loan is sanctioned against mortgage and the total loan amount is given back to bank at a time with interest. The rate of interest of loan is relatively less than other. A cash credit is an arrangement by which the customer is allowed to borrow money through a current account up to a certain limit against mandatory mortgage. The loanee can withdraw up to the sanctioned limit at a time or partially. The interest of this credit is quarterly payable and yearly adjustable wit interest. The loanee has to pay the interest on only the withdrawn amount have been user for how many days. The interest rate of this credit is high but less than overdraft. An overdraft occurs when a cheque is written on uncollected funds. It's usually a temporary arrangement and is granted to the customers having current account. At high interest rate this credit is given against personal mortgage that means the person who has intimate relation with bank and given back to bank as soon as on short call of bank. Bank disburses which loan to its clients by issuing commercial & business documents such as - bank draft, pay order, bank guarantee & credit card is called Commercial documentary credit. It's a bill of exchange payable on demand drawn by the banker on the head office at the request of a customer. Moreover it is a draft which is payable immediately upon sight or presentation to the drawee. It is a cheque drawn by a branch of the bank on itself. Pay to order is a negotiable instrument that is made payable to order can be negotiated only by endorsement and deliver. It's one kind of debenture by which the certainty of paying the specified limit of loan amount is given from bank. Client can purchase goods and services from specified individual or organization, even can withdraw cash, moreover can perform national & international trade using which card provided by bank is called credit card. Bank disburses which loan to its clients by issuing non-commercial & non-business documents such as - travellers cheque, circular note, circular letter of credit, debit & credit card is called non-commercial documentary credit. Travellers Cheques are the cheques issued by the bank by which the holder required to sign at the time of encasement at foreign coins or money to foreign branch or agents of that issuing bank. Traveller has to take the government approval before collecting travellers cheque. Travellers Letter of Credit is a L/C which a bank issues travellers for the convenience of the persons who want to travel with in the country or abroad. It is two types. ii) Circular Letter of Credit. It is a non-commercial credit document or a series of credit documents holding variety amount each issued and ordering by bank on its one or more than one foreign agent or branches to give particular amount of money to specified individual within a certain time period. Credit based on objective may be two categories. Bank provides which loan for commercial sectors is called commercial loan. Such credit is given through loan, cash credit, overdraft or documents. Bank provides which loan for non-commercial sectors is called non-commercial loan. Such credit is given for household development, accommodation facilities, or travelling sectors. Credit on the basis of period may be differentiate by three categories. Which lone is issued by bank for short while that means the duration of this loan may be from a few hours to maximum one years is called short- term loan. It is two types. I) Credit at short call. ii) Credit at short notice. Which lone is issued by bank against mortgage at higher rate of interest than short term loan for a mid while that means the duration of this loan may be from one year to maximum 5 years is called short- term loan. Which lone is issued by bank for long time that means the duration of this loan may be for more than 5 years at the high interest rate against valuable mortgage convertible in cash due to house & industry establishment is called short- term loan. You have shared a nice article here about the bank loans. 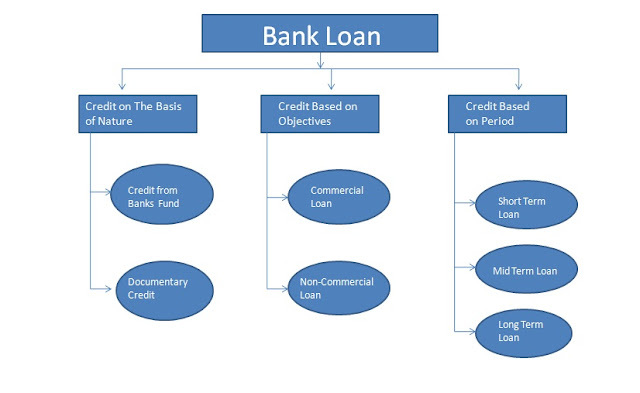 Your article is very informative and useful to know more about the different types of bank loan and bank advance. Commercial Loan Lenders Texas offers the commercial loan at the affordable interest rates.